A general sports blog with plenty of football content. I waited a while before writing this piece. Time is often required if we are to accurately judge the recently departed. Both our individual and our collective memories need space in which to fairly take the measure of the man, to assess his significance and gauge our loss. This is especially true when the past is so recent, and the recent past is so raw. And disappointing. Thank Shankly we don’t have to put up with any more of those eulogies. The close season has provided enough transfer drama to distract even the most misty-eyed of Gerrard fans. Yet as the Premier League gets underway it still seems strange that Stevie G won’t be running out at Anfield this season. That Steven Gerrard’s Liverpool career would eventually come to an end was inevitable, that the end should have lasted so long was not. By announcing his decision to swap Liverpool for Los Angeles at the start of the year, Gerrard inadvertently embarked upon an interminable farewell tour. The team stuttered. Gerrard, when not out injured, jogged through games in almost somnambulant fashion. For a brief time it looked as though the club might engineer a moment of serendipity, but defeat to Aston Villa cost them an appearance in the FA Cup final, which coincided with Gerrard’s birthday. The man who for over fifteen years had helped to paper over the cracks of his club’s mediocrity surely deserved a better send-off. By the time Liverpool were thrashed 6-1 at Stoke City on the final day of last season there was nothing left to write. There was no doubting that, when on the top of his game, Gerrard was one of the best midfielders in the world with a skill-set few could match. Don’t just take my word for it – Zinedine Zidane thought Gerrard at his peak was the best midfielder in the world and was “desperate” for Real Madrid to sign him in 2004. But ever since his debut in 1998 Gerrard was more than the sum of his footballing parts. He was talisman, leader, stalwart and inspiration. Gerrard’s time at Anfield was defined by sport’s essential binary: success and failure. First is his catalogue of unforgettable moments, each easily encapsulated in a word or two: Olympiakos; Istanbul; Cup final. At times Gerrard all but single-handedly dragged Liverpool to silverware. Second is what would go down as Gerrard’s lasting regret – his unsuccessful quest to win the Premier League. It could all have been so different if Gerrard had accepted either of the offers made by Chelsea in 2004 and 2005. Had he moved to London he would certainly have collected more winners’ medals. Alternatively he could have moved to one of the European powerhouses, gracing the Bernabau or the San Siro, and pocketing an even larger wage in the process. 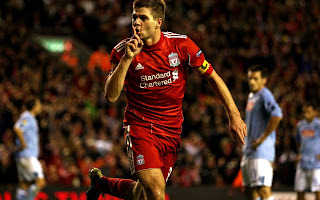 But Gerrard didn’t leave; he was always too connected to Liverpool, to the fans, the club and the city. Gerrard was raised on the Bluebell Estate in Huyton, a poor, working class area which perennially features in lists of the most deprived communities in the UK. In his autobiography Gerrard says little about the world in which he grew up, but does acknowledge that “money was tight”. He was barely a year old when the Toxteth riots took place, 5 years old when Derek Hatton joined the rate-capping rebellion, still only seven when Margaret Thatcher won her third term in Downing Street. And Gerrard was not quite nine years old when his cousin, Jon-Paul Gilhooley, died at Hillsborough. Liverpool felt the harsh effects of Thatcherism as keenly as any city in the country. It was the scene of a seemingly unstoppable economic decline; unemployment in the city rose from 10.6% in 1971 to 21.6% in 1991. In that same year Liverpool Riverside had an unemployment rate of 27.5%, with male unemployment at 37.7% – this was the highest unemployment rate of any parliamentary constituency in the UK. Boys from the Black Stuff was more documentary than drama. The government were advised to abandon the city to “managed decline”. By the time Gerrard played his first game for Liverpool the city had begun to show flickering signs of renewal, yet work remained scarce, poverty rife. Does any of this help us to understand Gerrard the midfield dynamo and inspirational skipper? Can we detect traces of his roots in his on-field mentality and never-say-die attitude? Maybe, although in life cause and effect seldom operates so cleanly. What is beyond doubt, however, is the effect Gerrard’s life story had on Liverpool fans. How could it not? Steven Gerrard and Jamie Carragher became the fabled Scouse beating-heart of the team, the local lads who provided a much needed identity for a club who could no longer be defined by its success. Moreover they gave fans an emotional link to a club that was adapting to the era of corporate football ushered in with the Premier League. When Liverpool last won the League in 1989/90 adult supporters could get a spot on the Kop for as little as £4. When Gerrard made his debut a similar ticket set you back £18. Today the price of admission ranges from £37 – £59 depending on the opposition. Working class people in Liverpool, indeed working class people all over the country, were, and still are, being systematically priced out of football. Gerrard in particular, with his all-action style and Roy of the Rovers heroics, became the embodiment of Koppites wish-fulfilment. Not only were he and Carragher players you could cheer on come match-day, they were proof that not everyone in the city was condemned to a life of joblessness and the harsh realities of alienation, monotony and poverty. Even if we couldn’t escape perhaps our sons or grandsons might. (Thanks to the sexism of both society and sport, such opportunities are not, of course, afforded to our daughters and granddaughters.) There seemed to be an organic link between Gerrard and the fans, one that was stretched to near breaking point by the Chelsea transfer saga. How could he even contemplate leaving Anfield? It wasn’t that we thought of him as ours, a footballer-commodity to be retained or traded on the whim of market forces. On some level we identified him as us. It is understandable that people should seek to use ‘loyalty’ as their frame of reference when talking about Gerrard. Loyalty to the club; loyalty to the fans. I have no objection but I do wonder if there is not another way of approaching the question. Perhaps it is not loyalty that defines Steven Gerrard, but rather aspiration. The candidates for the Labour Party leadership, who, with the honourable exception of Jeremy Corbyn, are a mix of re-animated Blairites and outright Tories, have talked a lot about ‘aspiration’ over the past few weeks. Their conception seems to be based on the belief that people are essentially only ever out for themselves, that they are selfish and greedy, and their only goals in life are nicer houses, bigger TVs, and newer cars. People won’t vote for you unless you can appeal to their sense of aspiration. It’s all nonsense – as Corbyn’s excellent campaign has demonstrated. But how does it apply to Steven Gerrard? Without question Gerrard could have gone to Stamford Bridge or Real or Inter. He would have made more money, won more medals, his status as a world class footballer would have been assured. I don’t doubt for a moment that he desperately wanted all of those things. However, he stayed at Liverpool, not through a lack of personal aspiration but because he wanted to achieve these things with the team he had joined as a boy. Gerrard’s aspiration stretched beyond mere individualism to include the club, the players, the fans. Perhaps in trying to identify the essence of Gerrard we have been looking in the wrong direction. We should instead have been asking what he could tell us about the world we live in and the football that we love. Gerrard’s career at Liverpool captured the contradictions of a working class game that has long since been bought and branded. He is the archetypal one-club player who is now at his second club. A millionaire who understands that aspiration is a collective endeavour. The irony is that for so much of his career as a player his aspiration was thwarted by the mediocrity of those around him.